Yes, I know many of us were just on spring break. But this coming week I’ll be on an anniversary trip with my wife. I’ll be wearing these…pretty cool eh? Hurricane themed board shorts. Nice streamlines, satellite imagery & weather maps while swimming. A weather geek’s dream. I’ll be back at work Monday May 1st. So hunker down and try to survive another showery week ahead. EVENTUALLY we warm up and dry out at some point. Of course the big question is when will that happen? We’ll see. We’ve been very busy the past 2 weeks revamping all our weather graphics. In fact the newscasts tomorrow starting at noon should look much different. TV stations do this from time to time and a fresh graphic look is way overdue. I’m confident the change will brighten things up quite a bit! We just set a new record today; a chilly one! WE’VE NEVER GONE THIS FAR INTO THE SPRING SEASON WITHOUT HITTING 65 DEGREES. The previous records were in April 1945 & 1950. In those years (as you see below), we finally made it over 65 on the 18th of the month. We didn’t do that today so now we’re in uncharted territory for PDX and a new record has been set for latest “FIRST 65 DEGREE DAY”. Of course those records go back about 80 years. 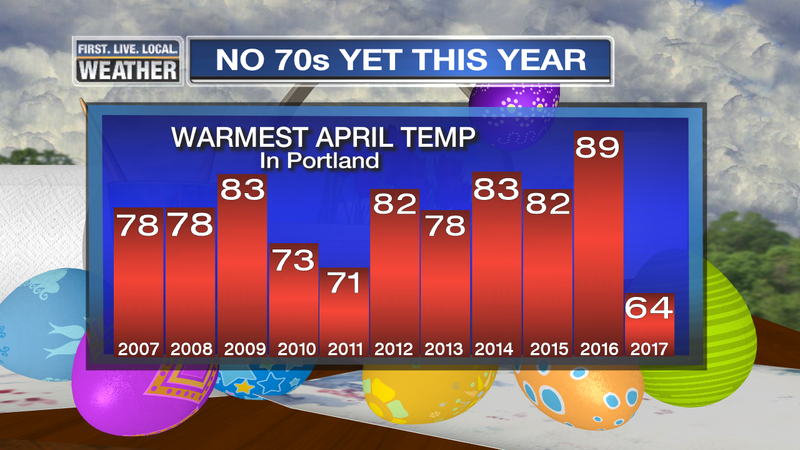 Compare it to the first 17 days of April last year! Wow…what a crazy warm month that was and a temperature pattern across the USA reversed from this year. By the way…even with the “cool-ish” 10 days ahead, our daylight does keep increasing. 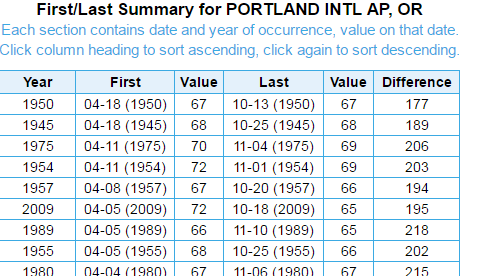 The sun set at 8:01pm in Portland today and will set beyond 8pm for the next 4 months. The next “pre-8pm” sunset will be the weekend before Labor Day (August 26th). Enjoy the long days! Here’s a great Easter Sunday sunrise shot by David Leahy. 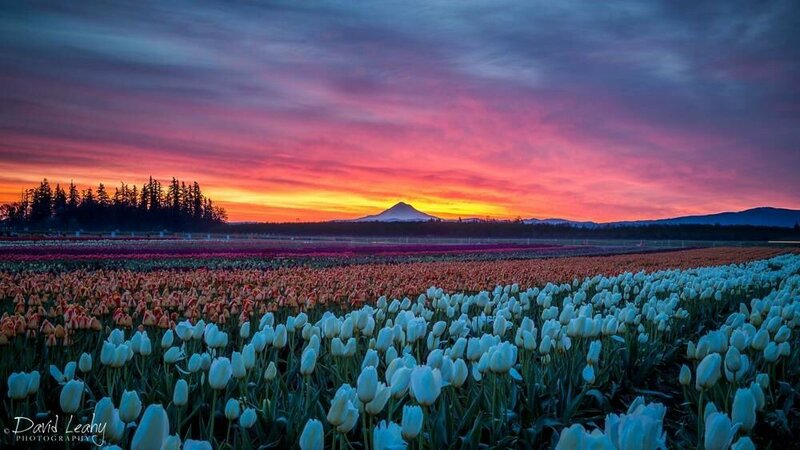 Of course he was over at the Wooden Shoe Tulip Festival near Woodburn. Seems perfect for this holiday doesn’t it? We’ve had a perfect weekend (for mid-April). This is the first time we’ve had a dry and warm weekend since sometime last fall. I got tons of yard work done the past few days and then today was a great day with the family. Potatoes, broccoli, spinach & strawberries are in the ground and ready for an evening soaking. But I’m back at work this afternoon and looking at maps/models…I’ll put up a fresh posting later this evening after I finish the forecasting. 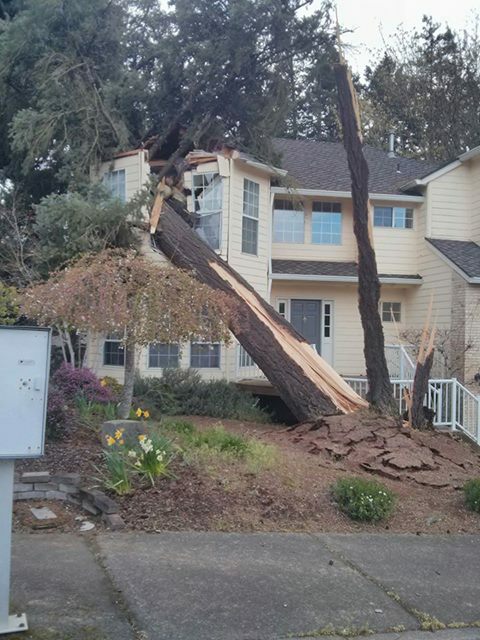 At 9am over 130,000 PGE customers are out of power and trees are down all over the place. 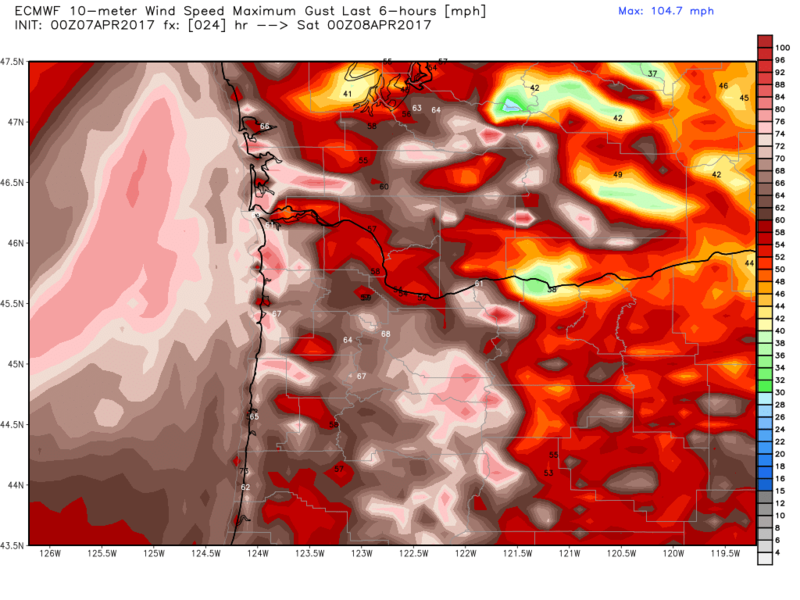 This is the type of storm where gusts will come and go. 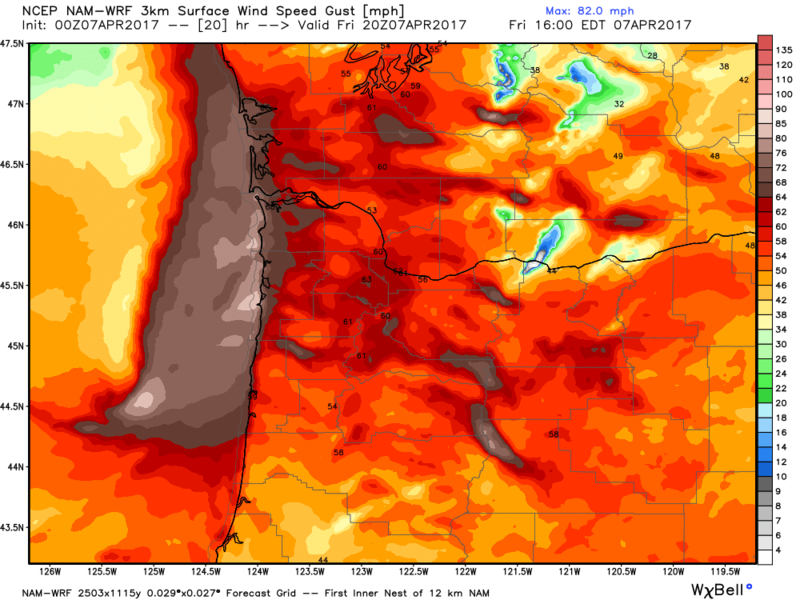 It might even be calm for a half hour, then a shower goes through and you get a gust to 50 mph. In general the wind dies down after the noon hour. Now here’s the tricky one…there is a reliable weather station in the West Hills near Council Crest. Typically in the past the observations have been just fine. Yet it has recorded several gusts from 80-98 mph the past two hours. It may be on a tower and if so those speeds are possible. And Chehalem Mtn. gusted to 73 before the power went out so one would assume it went higher up there too. Interesting eh??? After noon the wind should die down quite a bit. 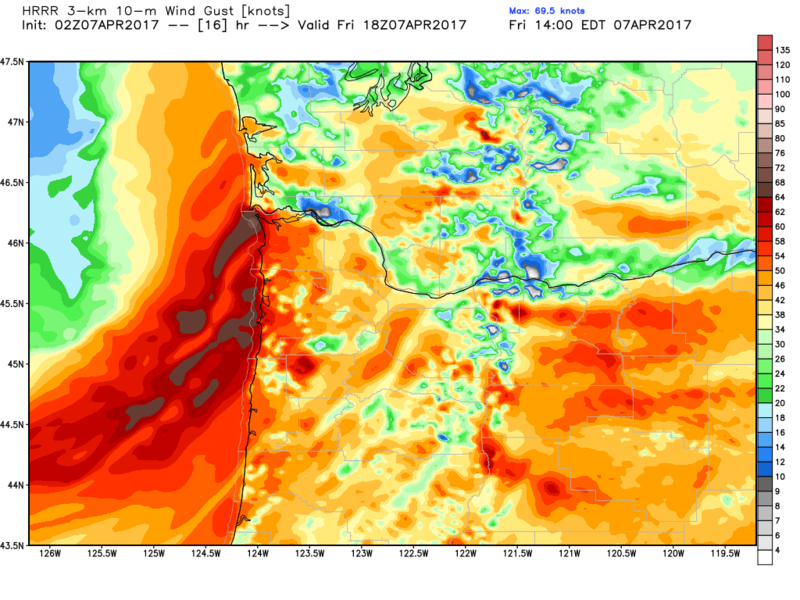 You are currently browsing the FOX 12 Weather Blog blog archives for April, 2017.